Publisher: Namco. Developer: Widescreen Games. 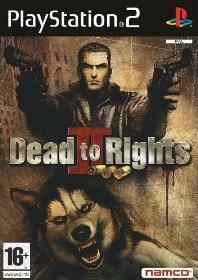 It’s hard to shake the feeling that Dead to Rights II was conceived a generation or so too late. Little of Namco’s usual style and panache are in evidence, leaving the player to battle with dated gameplay mechanics and a half-baked story that, thanks to an anonymous cast, never gets off the ground. When mixed with a raft of poorly-conceived ideas, you’re left to wonder quite why they bothered making it in the first place. The blurb assures us there’s some form of narrative surrounding rogue cop Jack Slade, but in reality DTR2 is, at the end of the day, a rather hollow third-person shoot ‘em up that challenges the player to grind through 47 very samey levels. Perhaps ‘challenge’ is the wrong word however; the methods you’ll employ on the first level barely evolve at all as you breeze through scores of forgettable missions holding the aim button and hammering fire. It’s like Syphon Filter never happened; there is no option to manually aim any of the weapons so the joys of picking-off targets skilfully at a distance (or indeed skilfully at close range) are absent. Any hints of tactical play also depart as there’s usually little point in seeking cover due to the simplistic all-guns-blazing approach many enemies employ to get around this. Even the simplistic action you are left with proves a hassle, as the camera (operated via the right analogue stick) more often than not stubbornly refuses to do as you command. The lock-on feature is also appalling, routinely ignoring enemies directly in front of you in favour of ones far-off over Jack’s shoulder that are often obscured by scenery. It's a dog-eat-man kinda game. These problems are compounded further in the woeful boss fights. Much like the levels themselves, all the bosses are exactly alike – not only can these figures survive multiple Molotov cocktails and a barrage of shotgun fire, they inexplicably go through phases of being indestructible. Matching wits with these figures wouldn’t be so bad if you weren’t hampered by the ceaseless respawning of goons who pin you down almost constantly and make locating and locking on to the boss an absolute agony. Namco may claim that Jack has a fairly decent array of moves at his disposal, but the fact of the matter is you’ll use hardly any of them. Jack’s party pieces include rolling across parts of the scenery, doing a highly suspect version of Max Payne’s bullet-time dives and a catalogue of cool though essentially unhelpful disarm/finishing moves at close quarters. Jack’s dog Shadow turns out to be the best extra by some way as he can prove quite an effective helper. After you lock onto a target, you can summon Shadow to charge and kill them, as well as returning to you with their weapon, which is handy if you’re running low on ammo. The best parts of the game are the hand-to-hand combat levels where guns are off the agenda and it’s your job to bash goons with your fists, bottles, baseball bats and anything else you find along the way. Granted, using Shadow really exposes the doziness of the A.I. as you close to quite a small distance before setting your pal on the stationery fools, but in the few levels you get to play like this, it’s already evident they’re considerably better-executed than the shooting bits. Given the team behind DTR2, it’s surprising how ordinary it is graphically. The early club and outdoor levels are really quite naff looking, and though the environments start to look a little better by the halfway point, there’s virtually nothing to interact with in the levels save the odd exploding barrel (in the event you can get a lock on it that is). Jack seems a touch bulky and cumbersome for a lead character, whilst elsewhere the enemies are samey and unimpressive-looking and even the FMVs seem noticeably low-rent and riddled with clichés. Other than the story, there’s an ‘Instant Action’ mode which sees you placed in a sequence of levels and charged with the task of (yep, you guessed it) killing a near-unending stream of goons that are thrown your way. So yeah, pretty similar to the main adventure then. Whilst there are extra difficulty levels and weapons to unlock, it’s unlikely you’ll inconvenience yourself. The guns are terminally dull to use and the game itself so utterly unengaging, that the prospect of dragging yourself through to see the credits even once is unlikely. Dead to Rights II is one of the worst titles Namco have ever overseen, and it’s quite remarkable they decided to drag up the ill-fated brand again in 2010. The shoot ‘em up action provides only for a brief period of very base enjoyment, with the superior (relatively speaking) melee combat having to play second fiddle to some completely unsatisfying gunplay. With several major technical foibles, the unsuccessful implantation of new ideas and a general lack of imagination to either the narrative or the level-design means DTR2’s problems far outweigh the positives. Dead to Rights II turns out dead wrong.